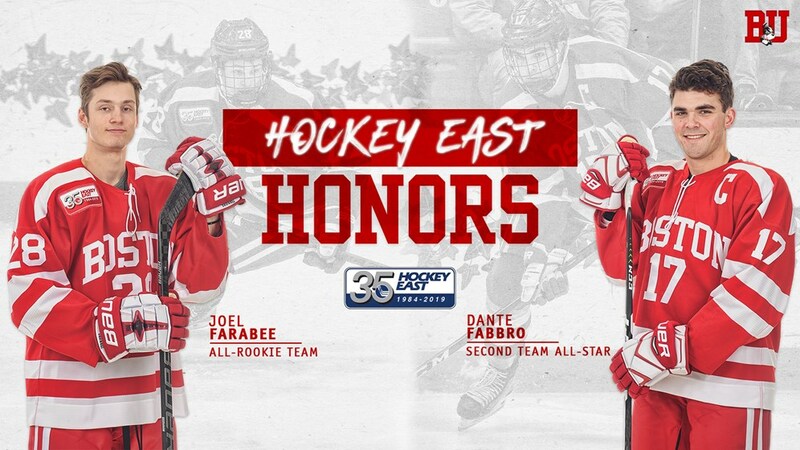 Junior co-captain Dante Fabbro and freshman Joel Farabee have been named to Hockey East all-star teams. Fabbro, who has 33 points and led the conference in blocked shots with 79, was named a second team all-star for the second year in a row. Farabee, who leads the Terriers in points with 36 and goals with 17, was selected for Hockey East’s All-Rookie team. BU has had at least one player named All-Rookie for the past 12 seasons. Past rookie honorees currently on BU include: Shane Bowers, Jake Oettinger and Patrick Harper. Coaches of the four Hockey East semifinal teams held an audio press conference today. BU Coach Albie O’Connell’s remarks begin at the 2-minute mark. Former Terrier All-American and Hobey Baker Award winner Chris Drury has been named general manager of the 2019 U.S. Men’s National Team, which will participate in the upcoming IIHF World Championships in Slovakia beginning May 10. Drury, currently general manager of the New York Rangers, will be assisted by an advisory group of hockey executives, including former Terrier and Minnesota Wild general manager Paul Fenton.